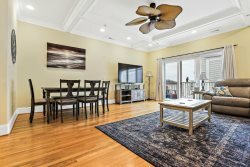 Beach Please is a comfortable oceanfront beach condo in Ocean Dunes at Kure beach that sleeps 6. This end-unit condo offers 2 bedrooms, 2 full bathrooms and a deck overlooking the ocean in front of the walkway out to the beach. The kitchen is fully stocked with everything you need to feel right at home. The kitchen has a peninsula bar with two bar stools, and also a table for four. The open living room features a fire place and sliders opening out to a large, partially covered deck with relaxing ocean views. The master bedroom with a king bed also has sliding doors which open up to the deck. The second bedroom with a queen bed has a separate bathroom which is accessible from the living room. This condo also features a small wet bar. Brand new pull out sofa and new washer/dryer installed summer 2018! Beach Please is located in Ocean Dunes, the only resort complex on Pleasure Island. The clubhouse with kitchen and meeting area is also home to the heated indoor pool, bathrooms with sauna, and fitness center. Outside you will find the tennis courts, basketball, shuffle board, a picnic area, and a playground. There are also two outdoor swimming pools and multiple beach accesses. The team was very responsive and expedited maintenance issues immediately! Working with Emily was a wonderful experience. Emily always promptly responded to my text messages and questions. My son and I had a wonderful vacation at the Beach Please property. The condo was pleasantly decorated with beach decor and made it very relaxing. The bathrooms were great. The master bedroom was great with a view of the ocean. The only disappointment was the beach access walkway was closed but that was due to storm damage and beach erosion. A situation that really couldn't be helped. This is a smoke free property. Any evidence of smoking will result in a $500 fine.